For me designing the MK Low Whistle was a solitary affair: days, weeks, months and then years of slowly refining a process. When I did eventually start work on the Toob, MK’s chromatic whistle, I was working in exactly the same way that I always had been – on my own. It was while I was staring at the computer, racking my brain (and probably cursing a fair bit!) trying to get to the bottom of one design issue or another, that Brian stuck his head over my shoulder and started asking questions about what I was up to. By chance, he’d been working with the company 4C Design, who work along side me at the Design Hub in Glasgow. I was immediately impressed by how quickly he grasped the problems I was grappling with. Over coming months I was to learn of his unique mix of talents for Art, Maths, Music, Science and Design. Almost similtaneously he was working on projects in Architectural science – solving complex 3D on cutting edge architectural design in the Middle East and beyond, in music – coming up with a new musical notation, illustrating a slew of design ideas for various people, while at the same time taking time out to Dance (Tango) and play the fiddle at Glasgow’s Fiddle workshop. It was immediately obvious to me what Brian could bring to the Toob project through his appreciations and talents. While we still have a long way to go in terms in developing collaborative working methods between ourselves and the music community, I feel we could be on to something with a huge amount of potential in years to come. I always found it amazing that there wasn’t some form of chromatic whistle. I mean this is arguably the worlds oldest melodic musical instrument. Why would it be left out when almost all the other commonly thought of musical instruments are Chromatic. The number of times that I’d be playing, the music would change key and I’d have to pick up a different instrument, or awkwardly half cover a hole to play a note which sat outside the key. I only ever wanted one whistle – a tried and tested friend that I could take anywhere. I’m pretty sure I started making musical instruments just to be able to make this Chromatic Whistle that I wanted to play. But you certainly can’t make a nice Chromatic Whistle without making a great ‘basic’ one first. And so went 10 years of my life; filing, turning, banging, gluing, polishing, crafting, I worked long hours, often through the night to come up something of the highest quality that my hands, eyes and ears would allow. 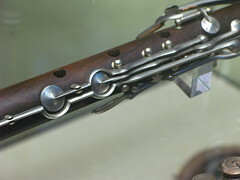 Early sketches were based on a revised version of the Boehm key system – as used on metal Flutes, Saxophones and Clarinets. But the more I looked at it, the more I realised that this heavily mechanised system was a product of the great age of mechanisation, and perhaps in an age where mechanics seemed to be the solution to everything, instrument designers had adopted it too enthusiastically. I thought it might be possible to something simpler and more elegant, and working with the mechanics of the hand. Even so, it was just an concept – I never expected it to work! But early prototypes surprised me – not only could I leave the original architecture of the instrument intact, but the extra notes notes didn’t seem to involve movements that were too awkward. The whistle is an instrument which has always survived on the fringes of society – with it’s simple charm it has been adopted by cultures all the way round the world. The challenge in designing and making the next generation might be trying to maintain the character of the instrument (and the music played on it). So I’ve been working on a project to create a chromatic whistle for roughly six years. It’s a typically long and protracted process for designing a musical instrument, but like so many of the things I’ve been involved with in the last few years, it might be taking longer than expected but it is actually turning out better than expected. 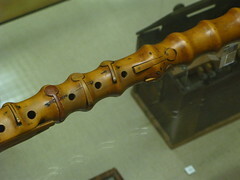 The instrument, which is likely to be called a ‘Toob’, is based on a new key system which leaves the initial tone hole layout and architecture of the whistle in tact – making it easy for musicians to adopt. At the moment, it exists as a working prototype (it works, but it looks rubbish! ), but there are still a few challenges to be faced in terms of the making and refinement. Until now I’ve kept the design ‘under my hat’ so-to-speak – this is certainly the ‘traditional’ way of approaching innovation – show somebody your ideas and they will steal them! But watching the effect that several big companies with this approach are having, and the recent emergence of collaborative working methods like open source, has caused me to think that there’s a huge amount to be gained from throwing the gates open, documenting our progress, and inviting feedback – so we can harness the expertise of the music community to make the best possible musical instrument we can. It’s an approach which will stand in complete contrast to the ‘romantic’ vision of a instrument maker, shut away, tirelessly working to perfect ‘their’ masterpiece. In addition to myself, designer Brian Loudon (Loud1design) will be collaborating on the project. It offers the opportunity for anyone to get involved with the design and testing of a next generation musical instrument. I for one am excited by what we might come up with.